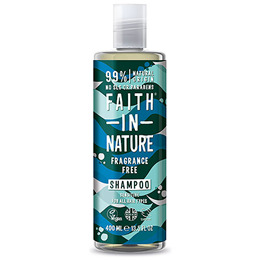 This wonderfully simple shampoo gently cleans the hair and scalp without the use of essential oils. Suitable for the whole family and all hair types, this neutral formulation is hypoallergenic and ideal for those with sensitive skin. Aqua (Water), Ammonium laureth sulfate*, Maris sal (Sea salt), Cocamidopropyl betaine*, Glycerin*, Sodium benzoate, Potassium sorbate, Citric acid*. * Vegetable derived. Rinse well and massage gently into wet hair. Rinse thoroughly. 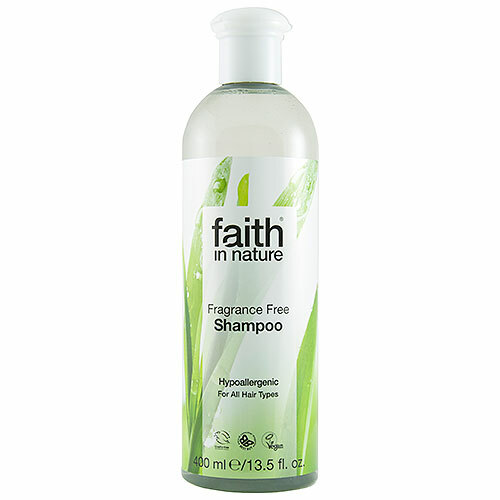 Below are reviews of Faith in Nature Fragrance Free Shampoo - 400ml by bodykind customers. If you have tried this product we'd love to hear what you think so please leave a review. Really nice, simple shampoo. Gentle on sensitive scalps and doesn't seem to dry out my hair like other products I've tried. This wonderfully simple shampoo gently cleans the hair and scalp without the use of essential oils.